Augsburg's commencement ceremonies this academic year are organized around the theme of global peace. Augsburg will welcome peacemakers and leaders to challenge and encourage graduates as they continue their lives beyond Augsburg. 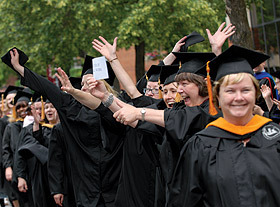 The July 1 commencement honors undergraduate Weekend/Evening College students from the Minneapolis and Rochester campuses as well as graduate students in business, leadership, social work, nursing, and education. The Richard Thoni Award, recognizing a graduating student who has demonstrated a dedication to community service, will be presented. This year's student speaker representing the Class of 2012 will be special education major Rebecca Hamlin. The Commencement speaker is David Mathews, president and chief executive officer of the Charles F. Kettering Foundation. Under former President Gerald Ford, Mathews served as secretary of Health, Education, and Welfare. From 1965 to 1980, Mathews taught history at the University of Alabama, where he also served as president from 1969 to 1980, an era of significant change and innovation, which included the integration of the institution. At age 33, he was the youngest president of a major university. Both Mathews and Martin Henker, the superintendent of the Evangelical Lutheran Church District of Leipzig, will receive honorary degrees. During the 1989 revolution in East Germany, Henker was instrumental in promoting peaceful protests, and he also counseled families of protestors who were imprisoned by the government and collected eyewitness accounts which were later used as evidence by an independent investigative commission to examine the acts of violence committed by state agencies against the demonstrators. In 2000, Henker became the senior pastor of the newly formed St. John Congregation in the Johannstadt-Striesen neighborhood of Dresden. See the July Commencement website for additional information.